Stainless Steel and Carbon Steel Horizontal Storage Tanks, up to 10,000 Gallons • 2007 Oxymat Continuous Flow Nitrogen Generator • Advantage Water Chiller • Stainless Steel Shell-Tube and Plate Heat Exchangers • Packaged Steam Boilers • Eurotech Biodiesel Washing System • Biodiesel Experts Stainless Steel Processing Unit • AI Raider Water Diffusion Radon Abatement System • (3) ACE-Rotomold Steel Tower Mounted Polypropylene Storage Tanks • And More! Peabody TecTank 12’ Diameter X 45’ Dual Chamber Cone Bottom Steel Silo, 3,530 Ft3 Capacity • (2) 1,100 Gal Stainless Steel Cold Water Jacketed Mixing Tanks with Variable Speed Drives • (5) 5,000 – 6,000 Gal Stainless Steel Vertical Storage Tanks • 2000 MSK Convertech 280 E-3 Vacuum Frame Shrink Wrapping System with PLC Controls • (5) 720 Gal Stainless Steel Tanks with Lightning Mixers • (10) Assorted 1 - 3 Yard Self Dumping Hoppers • And More! Over $3,000,000 Original Cost Chemical Processing Environmental Control Equipment, Electric, Plumbing, HVAC Supplies • New, or Like New Equipment: Ultra-Sonic Level Switches, Pressure Transmitters, Flow Meters, Check-Globe-Gate Valves, Transfer Pumps, Re-Circulating Pumps, Electric Heaters, Blowers, Good Quantity 100–200 Amp Control Panels, Junction Boxes, Switch Gear, 50–150 KVA Power Supply Units, Transformers, Batteries, Battery Chargers, Bradley Control Towers • Titanium Tanks, 6,000 Gal. Holding Tanks, Carbon Filter Stacks • And More! 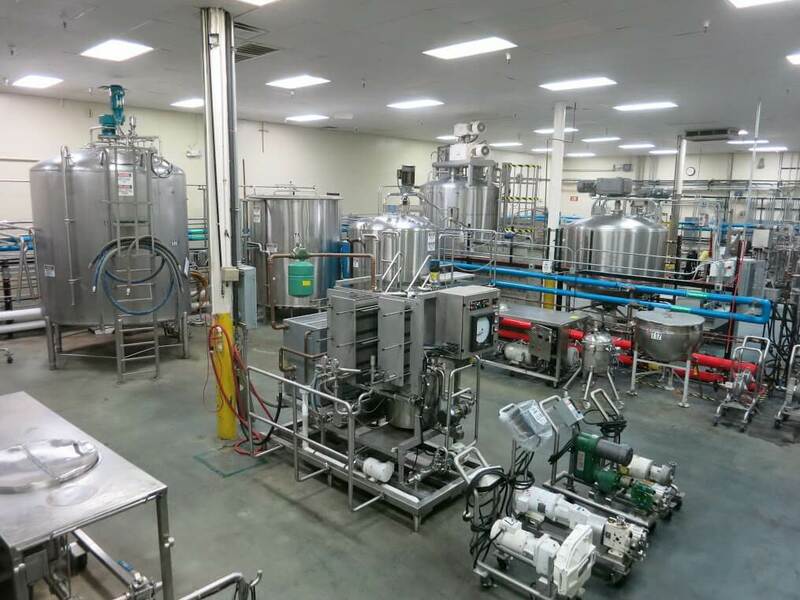 Electronic Fill Lines • Case Packers & Sealers • Tube Packaging Line • Hydraulic Piston Filler • Stainless Steel Mixing Tanks • Stainless Steel Steam-Jacketed Tanks • Forklift • Warehouse/Office Furniture & Fixtures • And More!